XS Noise members Jackson Murray, Jack Birkinshaw, James Sullivan, Vaughan Audrain and Jonathon Plumbley. 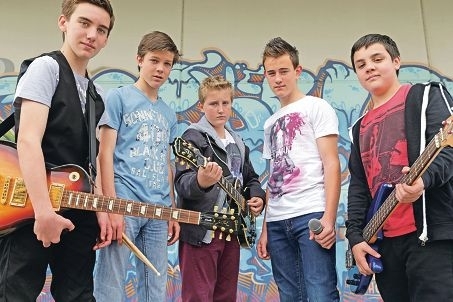 Among those taking part is rock group XS Noise which features four local 13-year-olds and 15-year-old Kelmscott vocalist Vaughan Audrain. XS Noise competed in the event last year but enter the 2014 edition on the back of another year of live performances and recent success. The group claimed the Serpentine-Jarrahdale Community Fair’s Battle of the Bands competition last month, and recently played live for a Fremantle radio station. The band has trained under the eye of musical tutors from Cockburn’s Rock Academy. Director Samantha Touchell said the band, while young, had something special. Guitarist Jackson Murray said the group had not set any targets and were taking each performance as it came. ‘It’s just one step at a time,’ he said. Battle of the Bands runs from 6pm until 10pm.